This healthy dish is perfect for the whole family - try cooking it on the BBQ when the weather is nice! First cook the green beans and potatoes. Bring two separate pots of water to the boil. Add the green beans to one and the potatoes to the other. Cook the green beans for about 5 minutes, then drain and refresh under cold running water. Cook the potatoes for about 10 minutes, until just tender and cooked through. Drain and set aside. Season the hake with a pinch of salt. Heat the olive oil in a large frying pan set over a high heat. 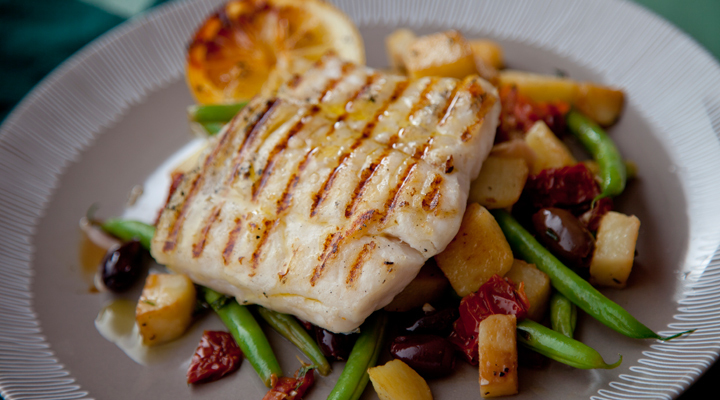 Place the hake in the pan, reduce the heat to medium and cook for 4 minutes on each side. Remove and keep warm. In the same pan, fry the potatoes for 3 to 4 minutes. Add the cooked green beans along with the olives, tomatoes, garlic and thyme. Cook for 1 minute, until the garlic is fragrant and the vegetables are warmed through. Season with salt and pepper and a squeeze of lemon juice. Serve with the hake. If you want to cook the hake on the barbecue, make sure the barbecue grill itself is good and hot so the fish seals and doesn’t stick to it. Season the hake well and rub both sides with olive oil. Place on the hot barbecue and cook for 3 to 4 minutes on each side. Alternatively, you could wrap the fillets in a tin foil parcel with a little butter, seasoning and some fresh herbs, then pop it on the BBQ for 6 to 8 minutes. Delicious! My children even enjoyed it and that's a huge thumbs up from my fussy eaters.